Before our former vice president invented the internet I had a habit of reading thick scholarly books. Now, I have to go hide out in the mountains for a few days or feign illness if I want to get through something really erudite. While I love these books they are the opposite of juicy. 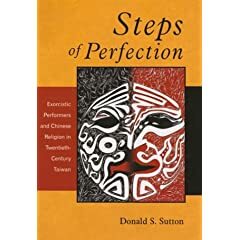 That being said, if you have the discipline or isolation to really read a book, Steps of Perfection: Exorcistic Performers and Chinese Religion in Twentieth-Century Taiwan , by Donald S. Sutton, is an impressive work. This book falls in the the category of books which are so scholarly they hint at the juicy ground breaking ideas rather than say them outright. With a book like this you have to read the footnotes or you might miss the best part of the argument. The scope of this book appears on the face of it to be narrow, but the implications of the book for conceptualizing Chinese martial arts, medicine and religion are huge. I'm going to spend a few days talking about this book so let me spin off for a minute to get you oriented. The long history of the survival of various civilizations could be viewed as the project of getting nice people to fight. There are now and there have always been, humans who love killing. The duty of the civilized and the free is to see to it that people who love killing do not get into positions of power; and that in the event that such people do get into positions of power, they get taken out. How that happens in each and every civilization or era is different. 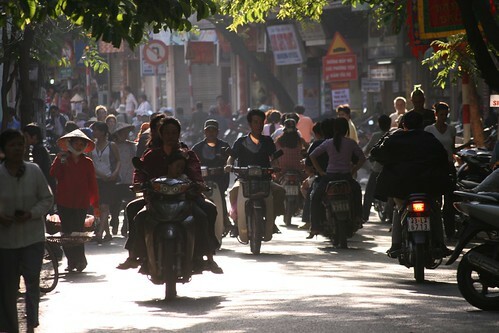 Historically in China there were several layers of organized armed groups which shared the duty of keeping power civil: Standing armies, militias, small professional forces maintained by a magistrate, and local family protection societies. How do you get people to support the common good in an environment in which there are competing interests. Part of what this book deals with is how people are connected through ritual, and how various needs of the different layers of society find their way into ritual expression. Yikes that's a mouthful. The jiajiang martial dancers share some of the important roots of modern martial arts. Sutton maps a spacial environment in which different ways of organizing reality overlap and interact. In one corner you have Daoist ritual which is done in private. Orthodox Daoists by definition do not subordinate to deities. They perform rituals with cosmological forces that go unseen by the general public, but exist in peoples' imaginations. People know about them, even if they don't see them. Daoists are part of a bigger landscape of ritual relationships, and they represent a particular approach to life. In another corner are the representatives of a government which has its own rituals. Historically, for instance, magistrates would arrive in an area with a sedan chair and an entourage, sometimes huge processions demonstrating real power. In another corner there are the trance-mediums who publicly speak for and with the gods, controlling and healing people with other worldly powers, spells, and self-mortification. Then there is the corner of medicine and elite scholarly exchange which merges in to the much larger realm of commerce. And then there is the popular realm where local elites interact with the guy who drives the gravel truck. Where martial artists train and perform gongfu, where school kids learn martial dance routines for a two day festival procession that twists around visiting local temples and homes. Where the presence of the dead is felt in places people frequent and exorcism is a regular occurrence. A place where gods and demons possess not just mediums, but the guy you went to high school with. The fighting dream dances of Taijiquan and Baguazhang came out of this world, and like everything else that grew up in Chinese society, these arts have a limb in each corner.